Your Daruma might come to some tabula rasa eyes – all white and untouched. It’s a little unnerving but it’ll serve you well in the end. Basically, when you receive your Daruma, you darken one of the eyes in setting a goal. For the purposes of this campaign you may commit to 52 adventures, or to sky dive or to call your estranged brother. Whatever it is that you consider a big goal, you darken the eye as you craft it. There now your Daruma can half see. But to instill total sight – to bring the glory of a victory into full frame you have to complete said goal! It’s only when your goal comes to fruition that you can darken the other eye. Look at that! No longer blind to that which once shunned you! Isn’t it a darling token to inspire bravery? So now I have my Daruma, and I will go home tonight and set my goal. I will carefully, ornately, and steadfastly paint on one eye, and in a years time, will post evidence of what came of my doll, my life, my future. Someone once commented on a blog post, long ago, in a blog different than this one, “Without darker nights, sweeter sunrises were never seen”. This was written in response to some daunting days and the sentiment never left me. 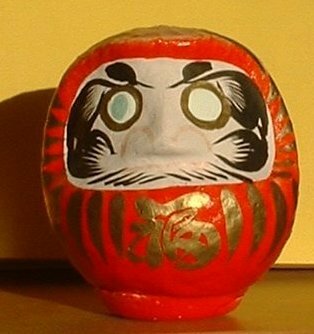 Especially today, in owing to the Daruma – the notion of vision and sight and how I am certainly capable of both.